* Valid through 1/17/2013. Not valid with any other coupons or discounts. No minimum order required. Not valid for discounted, special sale or case sale Douwe Egberts and Pickwick items. 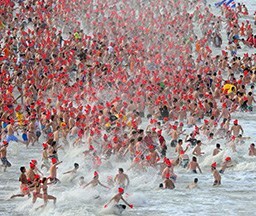 It is a Dutch tradition to begin the New Year with a dive into the icy lake and sea waters in Holland The Netherlands. This month, more than 60 towns and cities held events where participants enthusiastically strode into a frozen lake or the bitter cold sea. This tradition is celebrated by at least 25,000 hardy Dutch souls in freezing water every year. The tradition began more than 50 years ago when a swim club decided to start the New Year with a plunge into the sea. After getting national attention, a local soup brand decided to sponsor the event, which increases the number of participants and locations every year. The largest group of people diving into the icy water is in Scheveningen, a city in the northern southern part of Holland the country. There, more than 10,000 people that took the plunge this year. We find this is a spectacle best watched from the sidelines! BRrrrr! The combination of different environments, different sounds and smells all affect the way a person perceives the flavor of drinks and foods. How do you enjoy better coffee? Post your perfect way to enjoy a nice cup of coffee!